Recent debates about China have focused on its role in the gradual eastward shift in the global economy. This process was accentuated by the financial crisis of 2007-08 and ensuing recession in the West. But China’s rapid rise over the past two decades holds significance beyond the economy. As an emerging economic giant it is also becoming an increasingly important geopolitical and cultural force in the world. If this is to be the Asian Century, global interest in China’s cultural traditions and institutions will undoubtedly increase. For the Chinese government, education is an important instrument in building the country’s global status. There is no doubt that mass production of Chinese graduates will contribute to the country’s continued economic development. This is particularly true of its transition from an economy based on cheap labour and low skills to a technology and innovation-oriented economy. But education is more than a provider of high-skilled labour. It has been constructed to demonstrate China’s ambition of becoming a global power. China has been excellent at showcasing its soft power, from hosting the 2008 Olympics to the 2010 World Expo. Top status in the international education league table is just another signal. China’s education system is already attracting widespread interest. This is both for its massive expansion of higher education as well as its performance in the Program for International Student Assessment. The 2009 and 2012 assessment showed Shanghai topping the world league in reading, math and science. In math, Shanghai students outperformed the equivalent of nearly three years of schooling above most OECD countries. So what have been the key successes and failure of China’s educational development since the 1980s? There has been an impressive achievement in the gross enrolment ratio at all levels of education. By 2010, compulsory education was universal to all social groups. 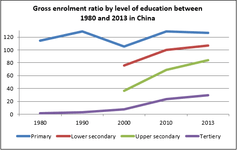 The enrolment ratio in upper secondary education increased from 36.7% in 2000 to 84.3% in 2013. 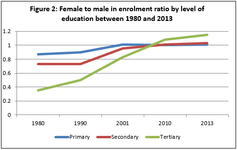 Enrolment in higher education rose from 1.15% in 1980 to 29.7% in 2013. Progress was achieved by a series of reforms. The nine-year compulsory education change came after the 1978 market reforms. It was subsequently legalised in the 1986 Compulsory Education Law. This aimed to provide the eligible population with free access to six-year primary schooling and three-year lower secondary education. The “two basics” policy was introduced in 2008 for implementing compulsory education in rural areas. This was aimed at universalising nine-year compulsory education and eradicating illiteracy among the youth. Higher education has also expanded massively since the 1990s. The “binggui” policy, initiated in 1995, ended the era of state funding and introduced private contributions to financing higher education. This was a contributing factor to the expansion of higher education opportunities. This has been one of China’s most significant achievements. The female to male ratio of participation in higher education was 0.35 in 1980. By 2010, the ratio had risen to 1.00. Female students were particularly impressive in achieving participation in higher education. 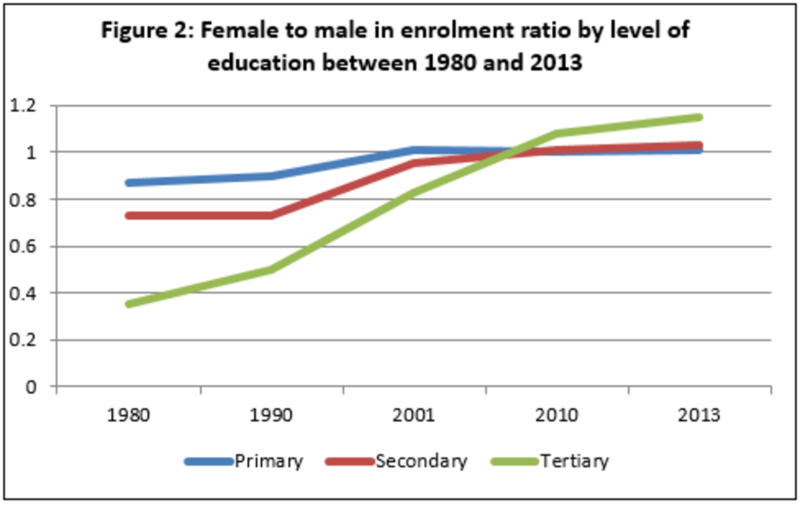 Since 2010 more girls have been enrolled in tertiary education than boys. This can be related to the one-child policy, which was introduced in 1980. The policy changed the family strategy in investing in education, especially in urban areas. Urban families achieved equal educational expectation and investment in the schooling of their only child. When a girl was born, she benefited from being the focus of all her parents’ aspirations and investment. The most striking failure is persistent geographical inequality – in the educational provision as well as life chance and opportunities. Educational studies have highlighted geographical disparity in terms of provision, resources, quality of teachers, funding and attainment at the schooling level. The regional difference is explained by the decentralisation of education funding and the devolution of responsibilities from the central to the regional level. For example, it has been shown that the ratio of primary education expenditure per student between Shanghai and poorest provinces doubled between the 1990s and 2000s. My research shows that the most acute inequalities in access to higher education in China are geographical. The highly uneven distribution of higher education institutions had direct implications on access for students from different geographical origins. Also, decentralised admission criteria and the quota policy gave powers to the local and institutional levels. This increased geographical stratification. The inconvenient truth of the devolved planning is that the power of the eastern political elites has grown. They support preferential access for their local populations. The quota policy and differentiated selection may have been influenced by concerns about inter-provincial migration. Graduates from eastern universities who originated from outside would be highly likely to remain in eastern cities on graduation. This would have increased the number of migrants. By limiting meritocratic access to eastern universities, the authorities were perhaps also seeking to reduce the problems associated with high levels of internal migration. Hence, the political justification for decentralisation policies in higher education results in a deep-seated contradiction. On the one hand is its development strategy. On the other are uneven regional interests. China has achieved an impressive record of educational development in terms of universalising compulsory education and improving gender equality. But there’s still a long march ahead to reduce geographical inequality and balance the interests between different regions. 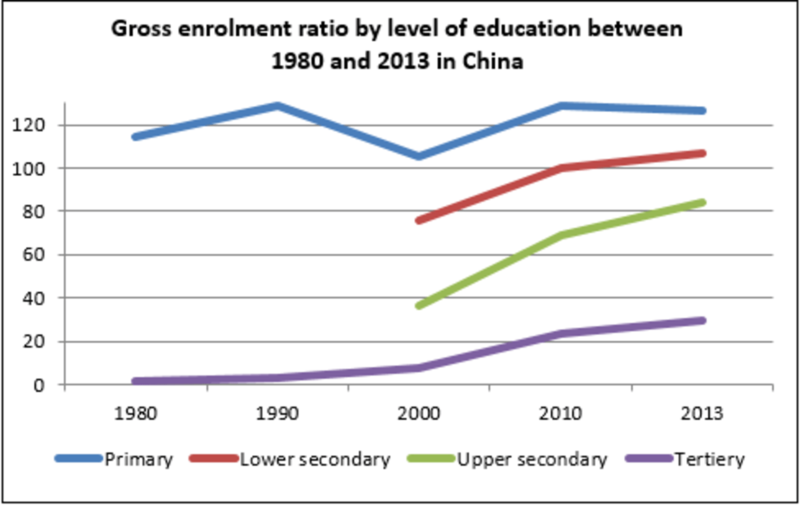 Data for the 1990 gender ratio in tertiary education are calculated from China’s Great Economic Transformation. Data on the 2001 gender ratio in enrolment in tertiary education is not available. Therefore the 2003 data are used for the comparison purpose. Author Ye Liu is Senior Lecturer in International Education, Bath Spa University. This article is licensed under a Creative Commons Attribution 4.0 International License. See original article here. If this article is of interest to you, you may want to check out a few of our books from the Chandos Asian Studies Series. All are available at the Elsevier Store at up to 30% off the list price. Enter discount code STC215 at checkout. The Strategies of China’s Firms: Resolving Dilemmas – focuses attention on a variety of firm-level arguments. Based on the in-depth investigation of strategies of China’s firms, the book specifically examines the primary drivers of China’s firm growth, analyzes the capability of China’s firms to sustain their growth and strives to address the long-term effects of the growth of China’s firm growth on the global economy. China’s Spatial (Dis)integration: Political Economy of the Interethnic Unrest in Xinjiang – provides the narratives and analytics of China’s spatial (dis)integration. Indeed, the Chinese nation is far too large and spatially complicated and diversified to be misinterpreted. The only feasible approach to analyzing it is, therefore, to divide it into smaller geographical elements through which one can have a better insight into the spatial mechanisms and regional characteristics. Chinese Migrant Entrepreneurship in Australia from the 1990s: Case Studies of Success in Sino-Australian Relations – Presents new theoretical considerations and empirical evidence to a growing interest in entrepreneurship, and presents an account of a group of new Chinese migrant entrepreneurs who have succeeded in their business ventures significantly contributing to both Australia and China. The Globalization of Chinese Business: Implications for Multinational Investors – The main theme of the book is the globalisation of China’s markets and Chinese business management in the context of ongoing reform at home and the country’s growing global economic role.